When parents find themselves alone after their children move out of the house—or when anyone's loved one moves out of the home—they may experience a very real sense of loneliness, lack of purpose, and even grief. These prayerful reflections on the Joseph story, the incarnation, and the last discourse of Jesus offer comfort and challenge to anyone with an empty nest. 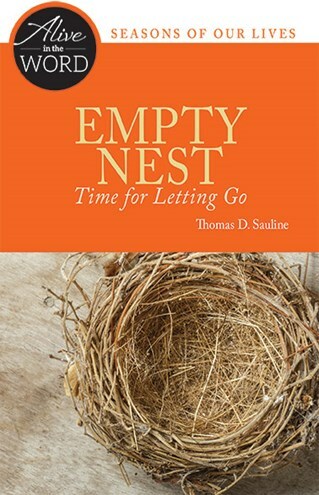 The word of God has the power to help empty nesters change, let go, and love anew. Thomas D. Sauline is a life-long religious educator having served as a high school religion teacher and parish director of religious education, and currently serving as a diocesan consultant for religious education. He holds a Bachelor of Arts in English and a Master of Arts in Biblical Studies from the Athenaeum of Ohio in Cincinnati; and a Doctor of Ministry from Saint Mary Seminary and Graduate School of Theology in Wickliffe, Ohio. He shares with Jeanne, his wife of thirty-five years, an empty nest after their three adult sons moved out.